CONREGO - manufacturer and supplier of the Application, CONREGO Spółka z ograniczoną odpowiedzialnością Sp. k., 66-400 Gorzów Wielkopolski, ul. Ignacego Paderewskiego 40/6, registered by the District Court in Zielona Góra, 8th Commercial Division of the National Court Register, under KRS number 0000717933, share capital: 465.921,50 PLN, NIP [Tax ID]: PL5993215859, REGON [Polish National Business Registry]: 369440687. Application - computer software within the meaning of the Polish Act of 4 February 1994. about copyright and related rights (Journal of Laws of 1994, No. 24, item 83, as amended), intended for the organization of events or promotional campaigns, whose basic functionality enables: registration of the Participants of the Event, service of ticket and ticket sales, invoicing, and sending individual and mass emails to the Participants of the Event. Administration Panel – the administrative part of the Application through which the Customer and Users can control the processes related to the handling of Participants. Website - a website run by CONREGO in the domains of conrego.pl, conrego.com.pl, conrego.com, serwiskonferencji.pl, informator-konferencyjny.pl or other Internet domains. Trial Account - an electronic account registered by the Customer, using a dedicated form made available within one of the websites, for activation and access to a free test account of CONREGO Instance for a period of 14 days. Customer Account - a registered Trial Account with the use of which the Customer has provided CONREGO, in accordance with facts, with current and complete business data required to issue a VAT invoice and to pay for at least one subscription in the selected Subscription Plan within 30 days. Subscription Plan - a configuration of CONREGO's offer published within the Website, the Trial Account interface and the Customer Account, differentiated in terms of Modules provided and subscription prices. Subscription Period - by default, a period of twelve months, which may change depending on the actions taken by the Customer and by way of individual arrangements with CONREGO. Instance - available based on the configuration resulting from the selected Subscription Plan on the server leased by CONREGO, Application available at the Default Domain selected by the Customer or Customer’s own domain. Technical Support - technical support for the Users in the use of the Application provided by: e-mail at support@conrego.com, chat on the Website and in the interface of the Application and by telephone at +48 95 735 15 96. Module - a set of functions available in the System to support a specific process related to the handling of an Event or its Participants. Database - a database in which all data collected by Users and Participants using the selected Instance of the Application are stored, stored and processed. The databases are maintained on servers located in the data centre in Kraków, leased by CONREGO from Krakowskie e-Centrum Informatyczne Jump s.j., ul. Zakopiańska 9, 30-418 Kraków, NIP [Tax ID]: PL6792736374, KRS: 0000127720, https://www.kei.pl. Default Domain - a subdomain of conrego.com domain, which is registered by the Customer during the process of registration of the Trial Account or during registration of the next instance of the Application within the existing Customer Account. The connection to the Default Domains is secured with an SSL encryption certificate. Event – a meeting organized by the Customer and supported by the Application. 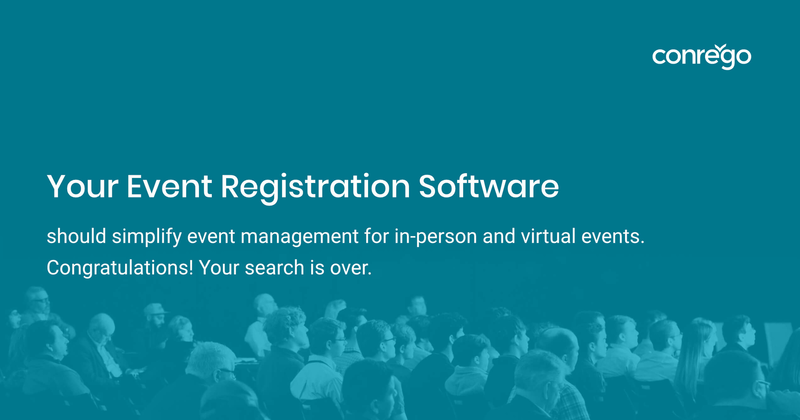 Event Website - Instance of the Application made available by the Customer to the general public by means of which the Users representing the Customer shall provide organisational support for Events, including registration of Participants and other activities supported by the Modules available in the selected Subscription Plan. Customer - oa person running a business or a legal entity registering the Trial Account, who is the organizer of the Event or acts on behalf of the Organizer as its subcontractor. User - a natural person to whom the Customer has entrusted access to the Trial Account or the Customer Account and one of the Instances, representing the Customer in relations with CONREGO. Participant - a natural person who uses a publicly available Event Website and performs legal actions, including entrusting their own personal data to the Customer. Glitch - an event caused by the appearance of a defect during the Application operation, after which the Application continues its operation and does not affect the data presentation. Bug - an event caused by a defect appearing during the Application operation; after the event, the function/application module cannot continue its operation or performs it incorrectly, which affects the data presentation. - the right to Technical Support in matters relating to the use of the Application. - any number of paid Instances. An Application Instance registered under a Trial Account shall expire upon the lapse of 14 days if the Subscription Plan assigned to it is not paid for. The Database and Customer Files collected within the framework of the Instance which has expired, will be deleted from CONREGO servers within 90 days from the day on which the Instance was subscribed to. Payment of the subscription within 30 days from the date of registration activates the Instance for the full Subscription Period. The Customer is not obliged to pay for the Instance and may cancel the service at any time. The agreement for the provision of paid services is concluded when the Customer receives an e-mail message confirming payment. In the case of cancellation of the service, the Customer is not entitled to refund of costs of the paid Subscription Plan. The Customer has the possibility to modify the data entered in the Customer Account and the Subscription Plan of selected Instances. A change to the Subscription Plan for the selected Instance while using the service will affect the remaining Subscription Period. The remaining time on the original Subscription Plan shall be reduced or extended in proportion to the difference between the value of the original Plan and the value of the newly selected Plan. In the case of subscription of the Instance at a promotional price, each subsequent extension of the Subscription Period shall be made at the standard price. The Subscription shall be renewed for a further period of one (1) Subscription Period after the expiration of the existing Subscription Period and payment of the existing or newly selected Subscription Plan. The current price list for Subscription Plans is available from the Website, the Trial Account interface and the Customer Account. The prices listed in the price list may change, but the change will not affect the duration of the Subscription Period of an active subscription. The Customer and Users are obliged not to disclose their passwords and logins to third parties and to store in secret the data enabling access to the Trial Account, Customer Account and Administration Panels related to Instances. CONREGO shall not be liable for any damages resulting from the provision by the Customer or the User to third parties of their own password and login used for registration and logging in of the User to the Trial Account, Customer Account or Administration Panel of the registered Instance of the Application. – other contents violating the law in force on the territory of the Republic of Poland. Violation of this prohibition may result in liability on the part of the Customer. CONREGO shall not be liable for the placement of prohibited contents on the pages of the Event Website. The above shall apply subject to Article 14 of the Polish Act on Provision of Electronic Services. In the event of receiving an official notification or reliable information about the illegal nature of the content posted on the Event Website by the Customer, CONREGO shall have the right to prevent access to such content or its removal. - the User representing the Customer is aggressive, uncultural or offensive towards CONREGO representative. CONREGO and the Customer shall have the right to assign to third parties the rights and obligations resulting from the concluded contract for the provision of the Service. In the event of an assignment being made by the Customer, the Customer and the Users representing it shall lose the right to use the Application. - Internet access with a minimum synchronous throughput of 512 kb/s. The Application Instance shall be made available on the CONREGO server on which the Application is installed, and the Customer and Users shall not be entitled to download (permanent multiplication) the Application and install it on another server. The use of the Application by the Customer may be connected with the simultaneous use of other CONREGO services under the conditions specified in separate regulations or agreements concerning these services. Within the framework of the concluded contract for the provision of services, CONREGO grants the Customer a paid and non-exclusive licence to use the Application in accordance with its purpose, with the functionality specified in the Subscription Plan during the paid Subscription Period. The above license entitles the Customer and Users to temporarily multiply the Application by displaying it and using it for the purpose of organizational support of the Event, including registration of Participants. The Customer shall not be entitled to make the Application available to third parties for a fee or free of charge, except for making it available to Participants to the extent necessary for their registration of participation in the Event and processes related to organizational support for the Event. The Customer shall be obliged to leave intact in the footer of the Event Website the information about the "EVENT WEBSITE POWERED BY CONREGO" together with a link directly to the CONREGO Website. Failure to fulfil the above obligation shall result in the loss of the Customer's right to use the Application, i.e. termination of the Service agreement with immediate effect. The service agreement shall be concluded for the period of one (1) Subscription Period, including the granting of a licence to use the Application for the same period. CONREGO reserves the right, but is not obliged, to change the features, functions, technical requirements and Subscription Plans for future versions of the Application. CONREGO stores backups of the Databases up to 72 hours back, but the Customer is responsible for creating and storing backups of all data collected in the Databases and Customer Files on the used instances of the Application on their own. - store up to 1 GB of Customer Files at any given time. Technical support for the Customer and Users is provided from Monday to Friday (with the exception of Polish holidays and Polish public holidays) from 9 a.m. to 5 p.m. CET/CEST (Polish time) or under the conditions set out in separate agreements. The execution of Technical Support may require the User to provide the agent with their login and password to the Administration Panel of the selected Application Instance. In such case, the User is bound to provide CONREGO with this information. Technical Support does not include assistance in the operation of: hardware, operating systems, other software and applications used by the Customer and Users. CONREGO's liability for improper performance of the Service Agreement shall be limited to the equivalent of the Subscription Plan purchased by the Customer. CONREGO guarantees the availability of the Application Instance during the Subscription Period at the level of 99% per annum. In the event of a service interruption during the paid Subscription Period, the total duration of which exceeds the maximum permissible duration of service unavailability, CONREGO shall be obliged to extend the Subscription Period of the service by 2 days for each commenced 24 hours of the total duration of the interruption. CONREGO reserves the right to interrupt the availability of its services to update the Application. The Customer shall be notified of the dates of such breaks by email as early as possible. CONREGO makes effort to make the breaks as easy as possible from the point of view of Event Website functioning. - actions of third parties which are not subcontractors of CONREGO or force majeure. In the case of detecting glitches or bugs in the operation of the Application, the User has the right to demand CONREGO to repair them within a reasonable period of time, depending on the nature and complexity of the bug (warranty repair). In order to fulfil the requirements resulting from Article 28 of the Regulation of the European Parliament and of the Council of 27 April 2016 on the protection of individuals with regard to the processing of personal data and on the free movement of such data and repealing Directive 95/46/EC (General Data Protection Regulation, hereinafter 'GDPR'), the Customer entrusts CONREGO with personal data for processing to ends and in scope necessary to satisfy the agreement. The Customer declares that the data entrusted to CONREGO for processing have been gathered in accordance with the applicable law, is the administrator of personal data and is entitled to transfer processing of personal data. - transfer of personal data to third parties and third countries. The Customer, who creates a set of data understood as a set of personal data in accordance with Article 4 point 6 of the GDPR, automatically becomes the Administrator of Personal Data of Participants who have registered (paid or free of charge) or whose data have been imported into the Database for the purpose of organizational support of the Event. CONREGO declares that it processes the entrusted personal data in accordance with the Article 28 (3) of GDPR, taking into account the nature of processing and available information, undertaking all measures required by the Article 32 of the GDPR. CONREGO reserves the right to disclose selected information regarding the Customer or User using the Application to applicable administrative bodies or third persons who demand access to such data basing on a valid legal basis, if and only if it is compliant with the law in force on the territory of the Republic of Poland. With the exception of above situations, no information regarding the User or any user of the Website shall be disclosed to any third party without consent from the User or any user of the Website. The User is responsible for the safety of Trial Account and Customer Account login credentials and cannot disclose these credential to third parties. Should there be a need to create an additional User account in a selected Instance of the Application, the form available in the Users section shall be used. The User is obliged to notify CONREGO immediately of any change in their own or the Customer’s personal data made available by them. In the case of failure to notify CONREGO about the change of personal data within 3 days from the date of their change, the User's existing data shall be deemed up-to-date. The User is obliged to update login credentials to the Trial Account or the Customer Account immediately if it is suspected that the data have been taken over by third parties. CONREGO informs that as soon as the User or another natural person connects to the Website, information about the number (including IP) and type of end device of the User or another natural person, from which the User or another natural person connects to the Website, appears in the Website's system logs. CONREGO informs that, in accordance with the provisions of the law in force in the territory of the Republic of Poland, it will also process data concerning the number (including IP) and type of terminal device of the User and other natural person using the Website, as well as the time of connection of the aforementioned persons with the Website. These data shall be processed in particular for technical purposes and for the collection of general statistical information. - provide the User with materials constituting advertising or promotion materials of the Website (in the event that CONREGO has a valid consent to perform the above activities). CONREGO has the right to publish on the Website information including the names and Internet addresses of the Event Websites run by Users using the Application, with the reservation that CONREGO is bound to remove this information at the individual request of the Customer or the User to whom the information relates. CONREGO has the right to use selected data characterising the Event Websites run by the Users with the use of the Application (including, among others, the number of registered Participants) for its own analyses, the purpose of which is to ensure the development of the functionality of the Application. These data may be published by CONREGO, but only as part of a summary of the use of the Application, in a manner that does not individualise Customers and Users and their Event Websites. The use of the data shall not include personal data of the Participants. The Customer who plans to sell tickets using electronic payments using the Application’s Payment Module must have an active customer account in the system of one of the payment operators whose platforms have been integrated with the Application: Stripe, PayPal, Blockchain.com, DotPay, eCard, FirstData (Polcard), Paylane, PayU, Przelewy24 or another available in the Payment Module interface. In order to integrate selected payment channels with the Payment Module, it will be required to provide relevant identifiers, configuration parameters and access data of the account in the payment platform in the Payment Methods section. - correctly configure and test the generation of proforma invoices and final invoices in terms of the correctness of the data contained in their content and other parameters required by law in the applicable tax jurisdiction. CONREGO shall not be liable for incorrect configuration of Payment Methods or incorrect integration with payment operators' platforms, or for incorrect transaction data, invoices or payment reports resulting from errors. CONREGO declares that it holds exclusive economic copyrights to the Application, with the exception of those elements of the Application which are libraries coming from the so-called open source libraries. The libraries are attached to the Application and are distributed in accordance with the license conditions governing their use. The Customer and Users acknowledge that failure to fulfill the above obligation may result in infringement of the exclusive economic copyrights to the Application and holding the Customer liable in this respect. CONREGO and the Customer, referred to as the Parties, agree that any information disclosed prior to the commencement and during the performance of the Agreement shall be Confidential Information. In particular, Confidential Information shall include information which constitutes a Party's secret within the meaning of Article 11(1) of the Agreement. 4 of the Polish Act of 16 April 1993 on combating unfair competition (consolidated text: Journal of Laws of 2003, No. 153, item 1503), covering all technical, technological, organisational and any other information of economic value, which is not generally known and in relation to which the Parties have taken appropriate steps to keep it confidential. Confidential Information is also any other information that does not constitute a business secret, but the disclosure of which could be harmful to the Parties. - use the Confidential Information obtained solely for the purposes of implementing Cooperation between the Parties. Upon request of the Parties, all Confidential Information obtained and its carriers shall be returned. - Confidential Information disclosed by a Party, where such disclosure has been made with the prior written consent of the other Party. The User has the right to lodge complaints concerning the quality of Service. The complaint should contain complete details of the Customer Account with the exception of the password enabling logging in and a description of the complaint. CONREGO will process complaints as soon as possible, but not longer than 14 days. The reply to the complaint shall be sent to the User exclusively via e-mail. The Parties declare their readiness to resolve any disputes arising from the implementation of the Agreement, in particular by amicable settlement. If no amicable settlement can be reached, the competent court for all claims arising under this agreement shall be the court applicable to CONREGO's registered office. The law applicable to the contract for the provision of services shall be the law in force in the territory of the Republic of Poland.